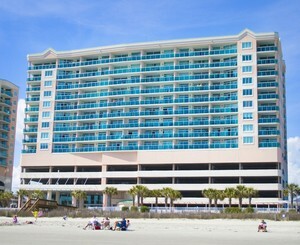 Crescent Keyes is one of the newer properties in North Myrtle Beach, and occupies a beautiful spot on the oceanfront in the desirable Crescent Beach section. These 2, 3 & 4 bedroom condos offer many luxurious amenities, including granite counter tops, crown molding, stainless steel appliances and much more. The property's beautiful architecture and landscaping adds to it's tropical appeal, where guests and owners can enjoy a variety of indoor/outdoor pools and jacuzzis alongside the swaying of the palm trees. With less than 100 units, this property is small enough to not feel overcrowded yet large enough to offer all the finest amenities. Wi-fi is available all throughout the property, and the glass walled oceanfront fitness center offers a simply breathtaking way to get in your daily exercise.